Clean the calamari, keep ink pocket and head but remove eyes and inside head. Clean the tentackles, slices. Marinate with lime juice and salt. Set aside. Process the Rica sauce in mortar and pestle exclude lemon grass, lime leaves and salt. 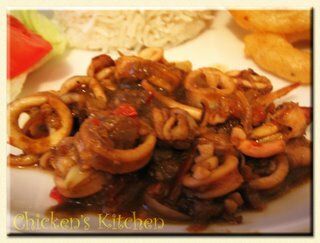 Preheat the pan with oil, add lemon grass, lime leaves, the rica sauce until sizzling and add the calamari including pocket ink. Add 50 ml water, until thicken and add salt. Served with steam rice.